After two stellar volumes under writer Charles Soule, I'd heard talk that Red Lanterns Vol. 6: Forged in Blood wasn't up to the same level. I was glad to find that wasn't the case, and that Forged in Blood is a satisfying end to this once-troubled-but-ultimately-redeemed title. Soule handles the three-part crossover with the Green Lantern "Godhead" event, and then Landry Q. Walker comes on for another three issues -- some horror, some funny, some superheroics -- before Soule wraps things up with a Futures End tie-in. Both writers do well by the title's hero Guy Gardner, and additionally Soule acquits well Green Lantern Simon Baz. All three of Soule's Red Lantern volumes come highly recommended. In my continuing look at the individual "Godhead" crossover volumes, Forged in Blood tells its own story following Gardner and Baz. Though Red Lanterns is among the most disconnected from "Godhead"'s ongoing story proper, it's important in that it introduces the New God Malhedron, who plays a major role over in Green Lantern Corps. Certainly Red Lanterns's "Godhead" issues end inconclusively with Gardner and Baz headed into battle (the concluding Green Lantern annual is omitted), but because the story is not as tied in as the aforementioned Corps, this didn't feel like quite as much of a let-down to me and Forged felt whole in a way Green Lantern Corps Vol. 6: Reckoning did not. The strength of those first three issues comes in Soule's strong writing of Gardner, as always, and also of Baz. Fresh from defeating the Red Lantern Atrocitus but losing numerous allies, Gardner's self-loathing is stronger than ever, and Soule's Baz picks up immediately that Gardner's superheroics belie a deathwish. Even as these issues mainly involve action sequences, Soule's nuanced characters raise the quality higher. The strong character work has been what's made Red Lanterns so readable (especially given how one-note they were prior to Soule's arrival), and here we have Gardner, heroic despite his flaws, and Baz, a seemingly peaceful warrior, though not above blackmailing Cyborg for assistance when necessary. Indeed, just as Soule has written Superman, Batman, and Wonder Woman in this title previously, his Cyborg is equally tough, complicated, and believable. I'd love to see Soule get a crack at the Justice League with his just-this-side-of-gritty take on the characters (and equally I'd have kept reading Red Lanterns with the Gardner and Baz team as "hard-traveling heroes"). Landry Walker's first Red Lanterns issue examines the aftermath of Gardner's fight with Atrocitus, and I was glad that battle wasn't so quickly forgotten even if "Godhead" interrupted things for a while. But also the issue is a gruesome horror story that ends with Gardner trying to sacrifice himself and being nearly beaten to death. It's an impressive outing, demonstrating that rather than shifting tonally from what came before, Walker is willing to double-down and take Red Lanterns even darker. As I've said before, the presence of artist J. Calafiore reminds me immediately of Gail Simone's original Secret Six, and these two titles also have in common the thoughtful, mature content that I wish more DC titles would offer. 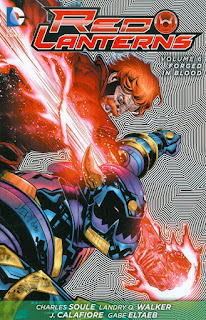 The following issues equally deal with the excess of red "rage energy" on Earth since Atrocitus's attack. Though Walker's run ends almost as soon as it begins, he posits a kind of Fugitive-type take on Red Lanterns where Gardner travels from town to town battling the red energy however it manifests. The first is intentionally silly, in which Gardner fights a pitched battle with a rage-powered baby, but again there's significant tragedy underscoring the whole thing. (Much of the "silliness" comes from Calafiore drawing the baby as large as Gardner's torso and perpetually wearing nothing but a diaper, even in images where the baby's mother has it out in a park; the issue might be more frightening than funny if it didn't look like Gardner was fighting a weird man-child.) The last issue utilizes well Gardner's sister from Peter Tomasi's Green Lantern Corps run, as the red energy almost becomes too much for Gardner ... and he's saved by a mysterious burst of blue "hope" energy. Soule's "final" Red Lanterns issue, a Futures End tie-in issue, is placed at the end of this trade, even though it was actually published between the end of the last volume and the beginning of this. That's clever work by collection editor Liz Erickson and company, since the issue picks up on Gardner as a Blue Lantern five years later as if Walker's last issue had actually lead into this. It's also a fitting epilogue since Soule returns to two of the book's standout characters, Bleez and Rankorr, and again with some of the same kinds of complicated and mature character interactions that have defined this run. I'm not in a hurry to see Guy Gardner as a Blue Lantern necessarily, which would in some ways mark the end of what makes the tortured character so interesting. At the same time, I appreciate that Charles Soule and Landry Walker get what makes Gardner such a compelling character, that even at his most obnoxious, Gardner's focus has always been doing good, even when that meant potentially sacrificing himself to become a Red Lantern. Though he sports a perpetually hard exterior, clearly that suggests there's a Blue Lantern on Gardner's inside. Since Green Lantern: Rebirth, the DC Universe has been blessed with a spate of smart portrayals of Guy Gardner, and I'm thrilled that extended to Soule's run and through Red Lanterns Vol. 6: Forged in Blood. I've seen a little bit of what comes next for Gardner in the Green Lantern Corps miniseries and I can't say it quite looks as promising, but as Gardner says at the end of this book, "we can hope." Again, this is a fine set of three volumes no one should miss. Yes. Though I'm curious now to read some of his Star Wars work.